Believe it or not, modern cameras are more complicated. My agent tells me that I have a reputation as an accomplished technician. That's part of the story, but not nearly all of it. While I am a self-professed geek (a product manager at Sony regularly marvels at my "insatiable curiosity" about his cameras) it's all in service to the career goal I set for myself as a 12-year-old: making moving images. My dad was an electrical engineer, and he was appalled that I wanted to become a cinematographer. "Why don't you look into X-raying airplane wings for stress fractures? That's photography too, and it's steady work!" My dad thought I was interested in making technically correct images, when what I really wanted was to make beautiful and meaningful images. When I started in the film industry as a camera assistant, and worked alongside some very talented film DPs, I found myself learning with a passion the technical details of filmmaking. This wasn't born of being a technician; rather, it was about knowing exactly how to light and expose film so that I got the artistic results I wanted every single time. There was no monitor to look at in those days. The DP lived or died by their eye and their light meter. I learned that I am very much like my grandfather. My dad is a brilliant technician who built sophisticated spy satellites during the cold war, but he's not any sort of artist. (My mom, however, is an avid painter.) My grandfather was an architect who built movie palaces in the 1920s. This was an era when getting dressed up and being seen was almost more important than watching the movie. The building itself was part of the spectacle, and indeed several of my grandfather's buildings are now designated as historical landmarks. This magnificent movie palace was considered "out there" for its time. This might have something to do with the sculptures of flute-playing dragons that adorned the tops of select columns, or the foreignness of middle eastern design at a time when few in the U.S. traveled outside of it. 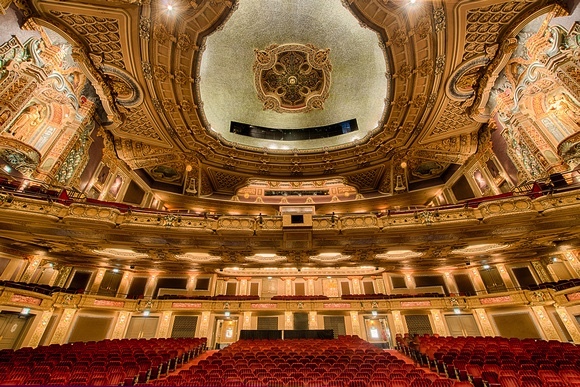 Now, restored to its former glory after languishing for decades, this theater is a venue for touring Broadway productions. The textures in this shot are amazing. No wonder my grandfather's architecture was considered avant garde in the 1920s. It's probably avant garde now! Like my grandfather, I create artistry through a deep understanding of my tools. He created architecturally stunning interiors while ensuring that his buildings didn't collapse on moviegoers. I deliver the best images possible, consistently, on budget and on schedule, by choosing the right tools for the job. I'm a natural writer, and I like to share what I've learned. When I learn something technical, I write it up for my fellow cinematographers. This, plus the fact that motion picture equipment companies come to me for feedback on what to build next, has apparently lead to many thinking of me primarily as a technician. This didn't happen to my grandfather, who was also an author. His book is actually available for download from Archive.org. My architect grandfather, Arthur F. Adams, in his natural environment. The funding to make this book, "Terra Cotta of the Italian Renaissance," was second prize in the Chicago Sun Times Building design contest. (My grandfather would have won, but a famous and established architect was allowed to enter after the deadline, and barely aced him out.) The photographer included him in at least a dozen plates. My grandfather, in turn, snuck my grandmother into a number of images. They traveled Europe together before they were married, which was quite shocking in 1925, but she was already a seasoned traveler. In 1915 she set out to see the world. Initially she made her way from Kansas to Alaska, before heading south to San Francisco to see the Panama-Pacific Exposition. Then she headed east, but only made it as far as St. Petersberg before being turned back by war. Gypsies taught her to tell fortunes, so she was able to support herself in style. She was married in blue. You rock, grandma! I recently wrote a series of articles for Canon on how to shoot footage specifically for HDR television. I didn't write it out of a desire to be a technician; I wrote it because I wanted to learn how to create the best HDR images possible so that, when HDR becomes commonplace, I'll be ready to make the most out of it. (HDR TVs are already on sale, so it's only a matter of time.) I use articles such as this as an excuse to get access to the right people, and then I use the actual writing of the article to ensure that I truly understand the subject. While in the research stage I asked very detailed questions of a number of manufacturers about how to shoot for HDR. All could tell me how the images were graded and broadcast, but none could tell me how to light and frame to create the best material possible for HDR release. Canon was the only one who said, "You know, we don't know either. Let's find out." And we did. So yes, I do enjoy the technical side of cinematography. I know way more about how cameras and lights and lenses work than most any other DP I know. But I use this knowledge to get everything set up perfectly before the shoot happens, so that I can walk onto the set and think only about lighting and framing. I make all my technical decisions in advance, specifically so I don't have to think about them on the shoot day. That's when it's all about lighting, mood, movement, color... and consistently excellent results. As best I know, no one has ever looked at my website and thought, "Now there's a great technician." But, one never knows: you may be the first. Take a look and let me know what you think. Technical prowess went into making every one of the images on this website, but the images themselves are the result of a 12-year-old boy sitting in dark movie theaters and thinking, "Some day I want to make pictures just like these. I need to learn how." Arthur F. Adams III, in his natural environment.